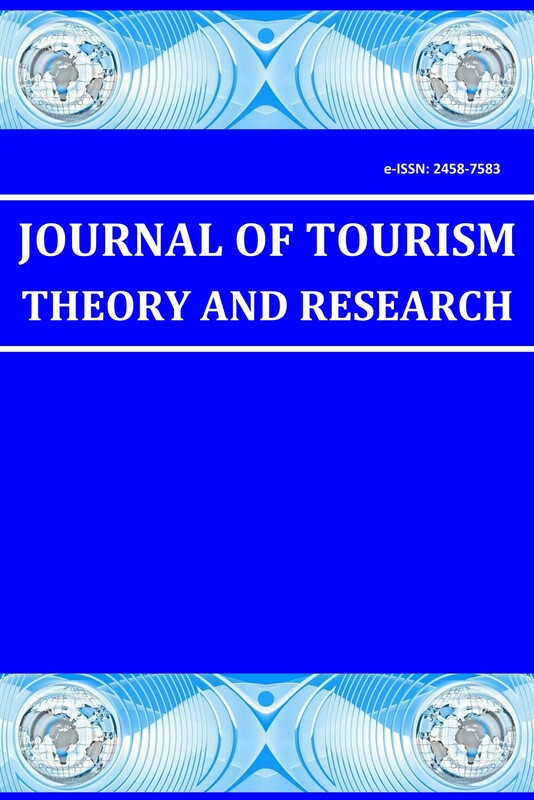 The purpose of this study is to determine the level of corporate reputation of five-star hotels in Belek for foreign tourists who prefer to stay in this region, and to examine how demographic characteristics of tourists affect corporate reputation level of these hotels. To achieve this aim, first, reputation, corporate reputation and the components of reputation have been examined. The importance of corporate reputation for hotels has been mentioned. What corporate reputation means for the tourism sector and for the enterprises operating in this sector has been explained. The sample of the study is a total of 343 persons of foreign tourists who have stayed in five-star hotels in Belek. Survey technique has been used as data collection method in the study. The questionnaire form has been composed by adapting the questions, which were developed by Fombrun, Gardberg and Sever (2000), to hotel operations. According to the results obtained, foreign tourists generally evaluate the corporate reputation of five-star hotels in Belek in middle level. Nevertheless, it has been determined that products and services, and emotional appeal dimensions are evaluated as more favorable. It is also revealed that foreign tourists, depending on gender, age, income and whether they visited Belek earlier, evaluate the reputation levels of hotels differently. Alnıaçık, E. ve Alnıaçık, Ü. (2009), Kurumsal itibar ve bölgesel kalkınmadaki önemi. Balıkesir Üniversitesi Burhaniye MYO Bölgesel Kalkınma Kongresi (pp. 47-54). Alnıaçık, E., Alnıaçık, Ü. ve Genç, N. (2010). Kurumsal itibar bileşenlerinin algılanan önemi demografik özelliklerden etkilenmekte midir?. Balıkesir Üniversitesi Sosyal Bilimler Enstitüsü Dergisi, 13(23), 93-114. Akgöz, E. (2009) Kriz ortamında turizm işletmelerinin rekabet aracı olarak itibar yönetimi. Modern Developmental Trends and Turkish World Conference (pp, 158-180). Akgöz, E., Başak Solmaz (2009). Turizm işletmelerinde itibar yönetimi, 19, 23-41. Arslanergül, B. D., Perçin Şahin, N. (2015). Otel işletmelerinde kurumsal itibar yönetimi: Kapadokya örneği, Kapadokya Turizm Paneli (1-9). Barich, H., P. Kotler, (1991). A framework for marketing image management. Sloan Management Review, 32(2), 94–109. Chun, Rosa, (2005). Corporate reputation: meaning and measurement. International Journal of Management Reviews, 7(2), 91-109. Dentchev, N. A. ve A. Heene, (2004). Managing the reputation of restructuring corporations: send the right signal to the right stakeholder. Journal of Public Affairs, 4(1), 56-70. Dolphin, R.R. (2004). Corporate reputation: a value creating strategy. Corporate Governance, 4(3), 77-92. Dörtok, A. (2004). Kurumsal itibarınızdan kaç sıfır atabilirsiniz?. İstanbul: Rota Yayınları. Dutton, J.E., Dukerich, J.M. and Harquail, C.V., (1994). Organization images and member identification. Administrative Science Quarterly, 39, 239-263. Erhan, T., İ. H. Çarıkçı (2016). Rus paydaşların türkiye’deki oteller hakkında kurumsal itibar algısı: antalya bölgesindeki beş yıldızlı rus otel müşterileri üzerine bir araştırma. Süleyman Demirel Üniversitesi İktisadi ve İdari Bilimler Fakültesi Dergisi, 21(2), 353-362. Flanagan, D. J., K. C. O'Shaughnessy, (2005). The effect of layoffs on firm reputation. Journal of Management, 31(3), 445-463. Field, A. (2000), Discovering statistics using spss for windows, London: SAGE Publication. Fombrun, C. J., (1996), Reputation: Realizing value from the corporate image. Harvard Business School Press, Boston, MA. Fombrun, C., Shanley, M. (1990). What's in a name? Reputation building and corporate strategy. Academy of Management Journal, 33(2), 233-258. Fombrun, C.J., Gardberg, N. A., Sever, J. W. (2000). The reputation quotient: A multi-stakeholder measure of corporate reputation. The Journal of Brand Management, 7(4), 241–255. Geçikli, F., M. S. Erciş ve M. Okumuş (2016). Kurumsal itibarın bileşenleri ve parametreleri üzerine deneysel bir çalışma: Türkiye’nin öncü kurumlarından biri. Atatürk Üniversitesi Sosyal Bilimler Enstitüsü Dergisi, 20(4), 1549-1562. Gotsi, M., Wilson, A.M. (2001). Corporate reputation: Seeking a definition. Corporate Communications, 6(1), 24-30. Greyser, S. (1999). Advancing and enhancing corporate reputation. Corporate Communications, 4(4), 177–181. Gümüş, M., B. Öksüz (2009). Turizm işletmelerinde kurumsal itibar yönetimi. Ankara: Nobel Yayınları. Kadıbeşegil, S. (2012). İtibar yönetimi itibarınızı yönetmekten daha önemli işiniz var mı?, Mediacat Kitapları, İstanbul. Koçoğlu, C. M. (2018a). Yerli Turistlerin Kurumsal İtibar Algılarının Marka Denkliğine Etkisi: Türk Hava Yolları Örneği. Turizm Akademik Dergisi, 5(2), 109-127. Koçoğlu, C. M. (2018b). Turizm eğitimi veren yükseköğretim kurumlarının itibar bileşenlerinin öğrencilerin memnuniyeti ve tavsiye etme davranışı üzerindeki etkisi. Eskişehir Osmangazi Üniversitesi İktisadi ve İdari Bilimler Dergisi, 13(2), 23-44. Hall, R. (1993). A framework linking intangible resources and capabilities to sustainable competitive advantage. Strategic Management Journal, 14(8), 607-618. Nakra, P. (2000). Corporate reputation management: CRM with a strategic twist?. Public Relations Quarterly, 45(2), 35-42. Neville, B.A., S.J., Bell, B., Mengüç (2005). Corporate reputation, stakeholders and the social performance-financial performance relationship. European Journal of Marketing, 39(9/10), 1184-1198. Nunnally, J. C., Bernstein I. H. (1994), Psychometric Theory, Third Edition, New York:McGraw-Hill. Önal, Y. B., E. Düzakın, H. Çiftçi (2006), Ekonomik Büyümenin Yükselen Değeri Turizm ve Türkiye Ekonomisine Etkisinin Analizi, İstanbul:Kare Yayınları. Roberts, P.W., G.R. Dowling (2002). Corporate reputation and sustained superior financial performance. Strategic Management Journal, 23(12), 1077-1093. Saxton, M. K., (1998). Where do corporate reputations come from?. Corporate Reputation Review, 1(4), 393-399. Scherer, R. Wiebe, F..A., Luther, D.C., Adams,J.S. (1988). Dimensionality of coping: factorstability using the ways of coping questionnaire. Psychological Report, 62, 763-770. Shamma, Hamed M., S. S. Hassan (2009). Customer and non-customer perspectives for examining corporate reputation. Journal of Product & Brand Management, 18(5), 326-337. Stuart, H. (2002). Employee identification with the corporate identity. International Studies of Management and Organization, 32(3), 28-44. Tabachnick, B. G., Fidell, L. S. (2012), Using multivariate statistics, Sixth Edition, Boston:Pearson. Tolbert, S. L. (2000). A Conceptual Framework and Empirical Test of The Antecedents and Consequences of Corporate Reputation (Doctoral dissertation), Ohio State University. Usta, Ö. (2009), Turizm Genel ve Yapısal Yaklaşım, Detay Yayıncılık, Ankara. Usta, M. (2006). Örgüt kültüründe halkla ilişkiler ve itibar yönetimi ege, akdeniz bölgelerindeki turizm işletmeler örneği (Yüksek Lisans Tezi), Dokuz Eylül Üniversitesi. Yağcıoğlu, A. (2012). İtibar yönetimi kavramının işlevselliği ve itibar unsurlarının birbiriyle ilişkisi: otel işletmeleri açısından bir uygulama (Yüksek Lisans Tezi), Balıkesir Üniversitesi. Yoon, E., Guffey, H.J., Kijewski, V. (1993). The effects of information and company reputation on intentions to buy a business service. Journal of Business Research, 27(3), 215-228.